In 2007, Smithfield Foods, the largest pork producer in the world, promised to phase out gestation crates by 2017, but changed their minds in 2009 after referencing an economic downturn. 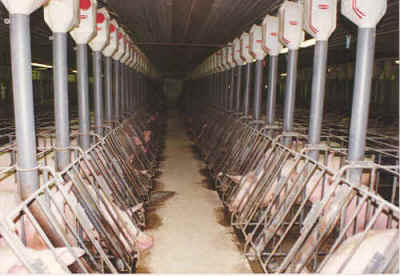 In 2007, Smithfield Foods, the largest pork producer in the world, promised to phase out gestation crates by 2017, but changed their minds in 2009 after referencing an economic downturn. Wayne Pacelle of the Humane Society contacted Smithfield CEO C. Larry Pope to express his disappointment in the decision, but Pope reassured Pacelle that "when we see a recovery, I will indeed set a timeline to complete this [phase-out] process." On December 15, 2010, the Humane Society released the results of a one-month undercover inquiry into Smithfield Foods. If you missed our article on this story, you can read it here. This is not an image from Smithfield...or is it? To summarize, the investigation found live pigs and piglets thrown into carts or dumpsters, pigs slipping through grated floor panels into piles of manure pits, no veterinary care to help pigs with conditions such as abscesses, and pigs crammed inside the aforementioned gestation crates. In mid-June 2011, The Virginian-Pilot (Smithfield's hometown newspaper) ran an article about Smithfield having "record profits," more than any year prior. The Humane Society has since posted a simple form on their website where you can easily send a message to Smithfield CEO Larry Pope asking him to phase out usage of "gestation creates." For more information on pig farming, I recommend checking out the 2009 film Pig Business described on IMDB.com as an "investigative documentary into the corporate takeover of pig farming and the devastating impacts this is having on our environment, local communities, small farmers, human health and animal welfare."